This movie best sums into a line from the movie: it's all about revenge. Jason Statham plays Arthur Bishop in this action movie. A hitman which makes a very clean killing so that no one suspects it's foul play. One day, one of the 2 head honchos of the company which hires him, Dean (played by Tony Goldwyn) informs Arthur that his next target is the other head honcho which Arthur is close to which is also Arthur's mentor, Harry McKenna (played by Donald Sutherland). Dean fabricated a lie saying how Harry sold out the company giving out mission details. So Arthur carried out his mission but for the 1st time, he's emotionally attached to the mission. 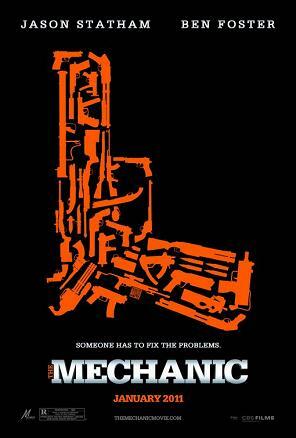 He felt sorry for his son and take him in and guided him to become a Mechanic (the term used in the movie as a hitman). The son, though, was a person who loves a challenge and thinks highly of himself and was very determined to find his father's killer and kill him. After a few missions and Harry's son, Steve (by Ben Foster) has gotten better, there was one mission where after completing it, they were discovered and had to split up and rendezvous at another place and time. There by accident, Arthur discovered Dean's lie and headed out to exact revenge on Dean because it's either him or them that's gonna be dead. That was when Steve found out that Arthur was his father's killer but kept it to himself until they successfully eliminated Dean. I like Jason Statham's style in action where he seems to be invincible in the Transporter movie series. But this movie, though supposed to be an action movie, falls slightly into the category of boring at the beginning and the middle part of the movie. It's only the ending part that it looks much more interesting. Even then, the big bad guy falls too easily seemingly unworthy to be the big boss if you ask me. I would therefore, give this movie 3 stars out of 5.